Morningstar, Inc. is a leading provider of independent investment research offering an extensive line of products and services for individuals, financial advisors and institutions. Visit most mutual fund websites and you will find Morningstar’s star rating alongside their funds. This rating system assigns one to five stars based on a fund’s past risk- and load-adjusted returns versus other funds in the same category. The site also offers analyst ratings, a forward-thinking analysis of the fund. Let’s go to morningstar.com. You’ll notice that the home page gives you timely information on market indexes, financial news and articles, and links to research. Most of these services are free and the rest can be obtained through a premium membership. Continuing down the page you’ll find a graph showing how $10,000 has grown over the last ten years as well as how it compares to its category of investment objective and its index. Below the graph is the performance box, which puts numbers to the graph information. The index line shows the percentage by which the fund did better or worse compared to the index. The next line indicates how the fund fared in its investment category. Below the performance information, you will find the fund’s top holdings and the breakdown of top sectors in which the fund manager invests. This information will come in handy if you want to invest in certain companies or industries. Also when comparing funds and you are looking to diversify, check out this section to make sure your picks aren’t holding the same stocks. Now scroll up to the link bar below the mutual fund name. You are presently on the quote page. Each link gives you more detailed information on the fund. 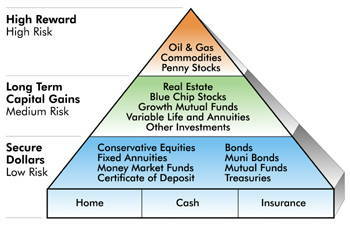 On the right side of the screen you will find the Morningstar Risk Measure, indicating the fund’s risk as it relates to the category’s risk. Let’s say you lean more on the conservative side and you want to invest in a stock mutual fund. You would look for a “low” on this line. The next line in this section shows how well its return has fared in its category. Of course something above average would be preferred. The style map indicates what type of fund it is. The asset allocation pie chart shows what percentage of the fund is invested in what type of securities. The manager name is listed and his/her starting date. Links to pertinent articles and information are listed followed by links to the fund’s filings. Morningstar offers a premium membership, which gives members access to additional investment research and tools to better manage their portfolio. Click on the “membership” link for more information.